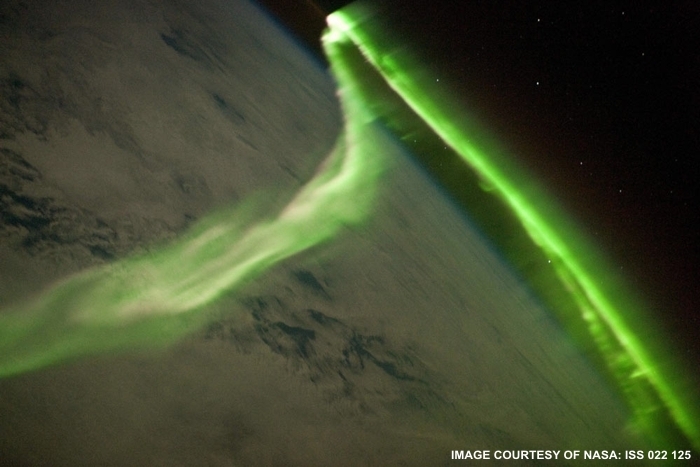 Answer: What you likely saw was a rare display of the Aurora Borealis (aka Northern Lights). In the southern hemisphere, they’re called the Aurora Australis. Most of the time, auroras have a greenish-yellow color. Red and blue are more rare. Which colors are produced depends on the amount of energy involved. 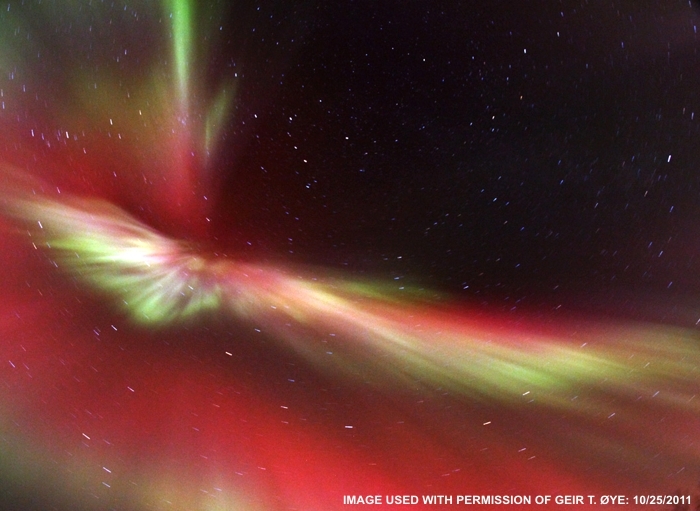 Auroras are caused by high energy particles streaming from the Sun. When they strike Earth’s upper atmosphere, they ionize gas molecules which in turn emit light. Oxygen molecules can emit green or red light, depending on the amount of energy absorbed. Nitrogen molecules can emit red or blue light, again depending on energy absorbed. This all takes place very high in the atmosphere, from 50 miles on upward. When the Sun fires off a burst of high energy particles (which it does quite often), they can be channeled by Earth’s magnetic field toward the north and south poles. This is why auroras are usually seen only at high latitudes. 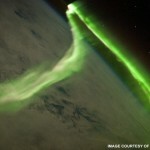 Whatever their color, auroras can also be seen from outer space. From that vantage point, it’s more obvious that auroras are high-altitude phenomena. The image below was taken from the International Space Station (ISS) last year. The ISS orbits at an altitude of 200-250 miles. Click on the thumbnail to enlarge. Auroras figure heavily in many mythologies. The word “aurora” is Latin for “dawn,” and for the ancient Romans, Aurora was the goddess of dawn. In early cultures of the far north, what is now Alaska, Canada, and Greenland, the aurora was thought to be the fire of torches leading the way to the afterlife for spirits of the dead.